It’s not often that the first company to popularize a new product category is still a market leader years later. Instead, other companies often develop exciting new features and even better designs. That’s not the case in the smart thermostat market, however, where the Nest Learning Thermostat is still the best in the business. This is a total no-brainer for any homeowner since it pays for itself by saving you money each month on your energy bills. It pays for itself down the road as a result, and then it keeps on saving you money forever. 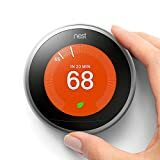 That makes the Nest Thermostat a smart buy at any price, but Amazon has a nice little discount available right now that should seal the deal for anyone who’s been having trouble pulling the trigger.